So many people seem to be dreading the impending end of summer. I’m not. There are things I like about all of the seasons, so I usually welcome the change. Winter has Christmas, one of my favorite holidays, and sometimes snow. I’m not a big snow freak, I mean, my favorite place to be when it snows is inside with a cup of hot cocoa and a warm blanket, watching cheesy romantic comedies. I do like it every now and then though. If it could just snow on Christmas, that would make me the happiest girl! I’ve lived in the south for quite a while now and Hawaii before that, so I haven’t seen much snow. I can remember maybe one time in my whole life, while living in North Carolina, where it actually snowed on Christmas. It was one of those weird snow storms which came out of nowhere. Wherever I have lived the entire town seems to shut down with a dusting of snow. It just doesn’t happen that often. Maybe that’s why I like it…the grass is always greener, you know! And then there’s spring, which brings beautiful flowers, Easter fun, butterflies, and strawberries! I love strawberries. Summer brings a much needed break from school, for me as a homeschool mom and the kids! I enjoy being with my kids and I love having the opportunity to homeschool, but breaks are welcomed and thoroughly milked for all they’re worth! I also like wearing flip flops…and summer dresses. Ugh, I guess it is kind of sad that summer is ending. But, that also means fall is coming! Fall brings pretty leaves, Thanksgiving, Black Friday (yes, I am one of the crazies who fight crowds at 4 am to get a deal) and PUMPKIN! I honestly think my favorite thing about fall is getting to eat pumpkin flavored things without getting strange looks. I guess I can understand when I serve pumpkin bread to someone in April, they may look at it for a moment hoping that it didn’t just come from sitting in my freezer for the past six months. And in July, how it may appear odd to the other neighborhood children when the kids bring pumpkin muffins outside for snack instead of popsicles or another summery treat. Thankfully I don’t have to hide anymore. I can publicly eat my pumpkin goodies and drink my pumpkin spiced latte to my heart’s content! Today I celebrated the coming of fall by making these gluten-free, dairy-free, refined sugar-free, and egg-free Glazed Pumpkin Crumb Muffins. If there is any bit of you, even just a teensy bit of you that likes pumpkin, you need to make these! They’re moist, pumpkin-y, and the addition of the crumb topping and glaze throws it over the top! Well, I’m off to eat another muffin.. You should join me! Moist and delicious pumpkin muffins full of healthy ingredients. These may be free of gluten, dairy, eggs, and refined sugars, but they're full of flavor! Preheat oven 350 F. Line a muffin pan with paper liners or grease well. In a small bowl combine oats, almonds, and coconut sugar. Add the butter and use your fingers or a fork to cut the butter into the oat mixture until butter is thoroughly mixed in and mixture is crumbly. Set aside for later. In a large bowl mix together the dry ingredients: flour, flax seed, baking powder, baking soda, salt, and the spices. Add pumpkin, maple syrup, oil, and milk, mixing just until blended. 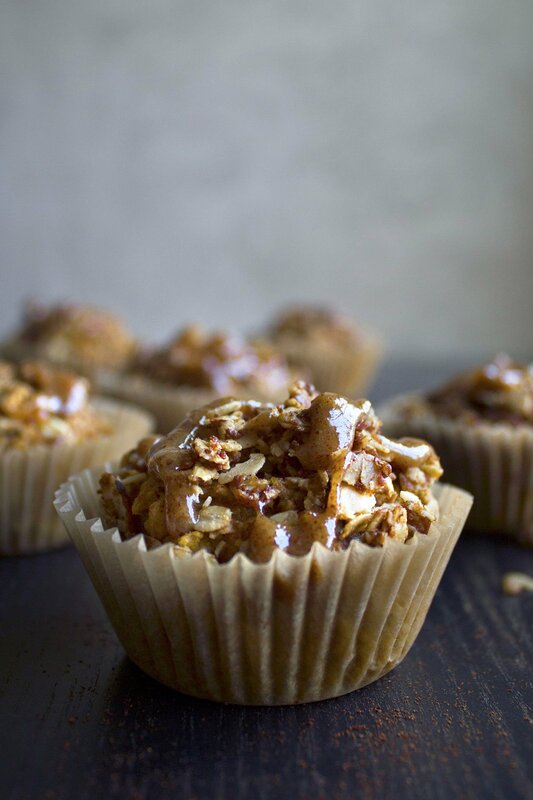 Fill muffin liners two-thirds full and then sprinkle the oat crumble on top. Place in the middle rack of an oven and bake for 25-30 minutes or until a toothpick inserted near the center comes out clean. Mix together the almond butter and maple syrup in a small bowl until combined. Mix in the almond milk a little at a time, until the consistency is thin enough to drizzle. A little more milk may be needed. Drizzle on top of the muffins after they have cooled. *You can also use 2 cups of a gluten-free all-purpose flour blend instead of the rice, oat, and tapioca flours. **To make oat flour you can grind old-fashioned oats in a food processor. You can use regular oats if you don't need them to be gluten-free. This sounds so delicious and healthy. I’m so impressed at your gift of creating such recipes! this looks SO good. love the idea of almond butter + almond milk for a glaze- never thought of that but it looks even better than the nonhealthy confectioners glaze version! Thanks, Minna! It’s a nice change from traditional powdered sugar glazes. The almond butter/maple syrup combination is really yummy too! Congratulations! The blog looks stunning. And hooray – I figured out how to leave a comment. I don’t know which blog hosting site you’re using, but for my blog, if I want a ‘read more’ section, I need to click on a little icon that looks like a screen cut in half. I’m guessing it’s a universal icon? Hope that helps. Haha, thank you so much, Kimberly! Sorry for confusion. Apparently I still have a lot to learn on the technical side 🙂 We (as in my hubby) finally figured out how to cut the post on the main page so that you have to click to finish reading, which makes it easier to see the comment section. I appreciate you taking the time to leave a comment and share that info! I’ll ask him if he used that icon. It seems pretty easy, if that’s all you have to do. Thanks again!! Fantastic start to a great looking blog!! Those muffins are making me drool as I imagine how good they must be! P.S. I’ll trade you my snow this winter, ok? Thanks, Renee! You have an abundance of maple syrup where you are, so you should definitely make some this fall! Thanks, Elizabeth! I know what you mean. Like with turkey…Sometimes I wonder why we only make a big turkey at Thanksgiving, but after eating it for days and getting sick of it, I see the value in saving it for once a year! We welcome taste testers! I have a feeling my family likes just about anything I make, so they’re not the most reliable judges, haha!